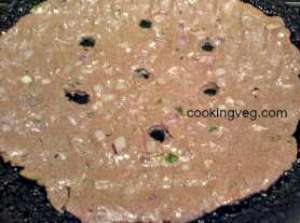 This finger millet bread - ragi rotti recipe is a Karnataka recipe. It is called Ragi roti or rotti in Kannada, an Indian language. It is made from Finger Millet. Finger Millet is Sattu / Manduva(Hindi), Ragi (Kannada) or Nachani (Marathi), Ragulu (Telgu), in Indian languages. Finger Millet is very good for health as it contains calcium, protein, minerals and fiber. This finger millet flat bread, ragi rotti recipe is a specialty from the southern state of Karnataka. 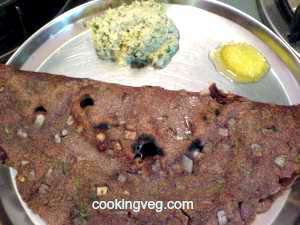 See the image where ragi rotti is served with Coconut Chutney and desi ghee. Finger Millet is also used in a ragi mudde(ball) form and is served with soppina saru(green leaf curry with lentils) or in a roti, upma or halwa form. 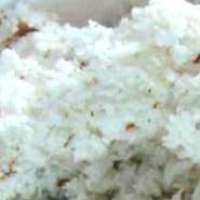 In Maharashtra, it is used to make Bhakari(a flat bread). Finger millet(Ragi/Nachani) is also used in the extract form(a porridge) as baby food for babies after they are 4-5 months old. 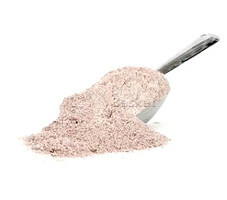 This extract is easy to digest and is also good for elderly people. 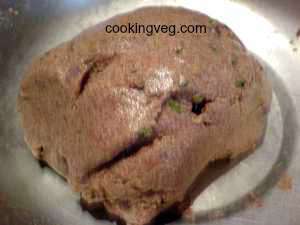 Here is the ragi roti recipe for you. It is served as a breakfast dish with coconut chutney or with a curry. A spoonful of ghee or a blob of homemade butter adds to the taste of this ragi rotti. Ingredients to make 2 ragi rotis. Mix ragi flour, chopped onions, chili, coriander leaves, grated coconut, salt in a bowl. Add water little by little and form into a dough ball. It should not be too soft. Divide the dough in 2 parts. On a girdle / skillet (tava), add some oil. Smear the tava with oil. Place one dough ball on the tava and pat it to flatten into a round (as thick or thin as you want). After a minute, reduce the flame to medium. Cook for 2 - 3 minutes. Rotti will change the color as it is cooked. Turn the roti. You can see the slightly browned / blackened edges where we made the hole. Cook the other side for 1-2 minutes. There is no need to cover the rotti again. 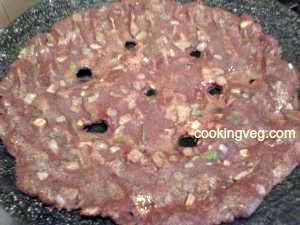 Prepare the other ragi rotti in the same way. Serve hot with Coconut Chutney or with Tomato Curry / Tomato Gojju or with Onion Curry / Onion Gojju. You may also serve it with your favorite chutney or curry. A little butter or desi ghee adds to the taste and flavor of ragi roti. 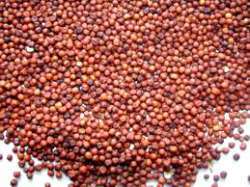 Question about finger millet - Is Nachni same as quinoa?